Yesterday's FMCB meeting has some items regarding commuter rail visioning and Red/Blue (not linking directly since the slides were posted as powerpoints). Had no idea the Lechmere viaduct was in such bad shape. Not surprised. The MTA just had to completely rebuild a viaduct that was built in 1912... I think Lechmere dates from around the same time. Keep in mind trains are much heavier today. The Type 9s are actually due sooner than that. They're not meant to innovate on the Type 7s or Type 8s, just add to the fleet size to allow GLX to function. They're essentially identical to the Type 8s, just more reliable. This new Type (likely Type 10) is an entirely different animal, and much of the $3.5B goes toward infrastructure improvements that allow them to be fundamentally unlike the current fleet. This is not only new vehicles - it's a reinvention the Green Line to make it more like a heavy rail line in places. Absolutely: By 2028, it'll be time to start phasing out the Type 7s (oldest will be 40 years old, some 30 years, most 10+ since overhaul and all "high floor"), while the Type 8s will be 20 ~ 30 years and not worth overhauling. So the Type 10s are going to be a complete re-fleeting, so it'd be nice to get features like: all low floor, more open designs, and One (or zero) operator per more passengers, and the ability to operate at higher speeds. If there's a pinch point (sharp curve) that's been both limiting speeds and dimensions, there might be a triple win in fixing it: more manufacturers with conforming designs, higher capacity trains, taking turns faster. Even if they decide not to fix any curves or humps, there's still length considerations (at the short stations they name) and weight considerations (on the Lechmere Viaduct). So it favors thinking in terms of infrastructure-and-rolling-stock packages. 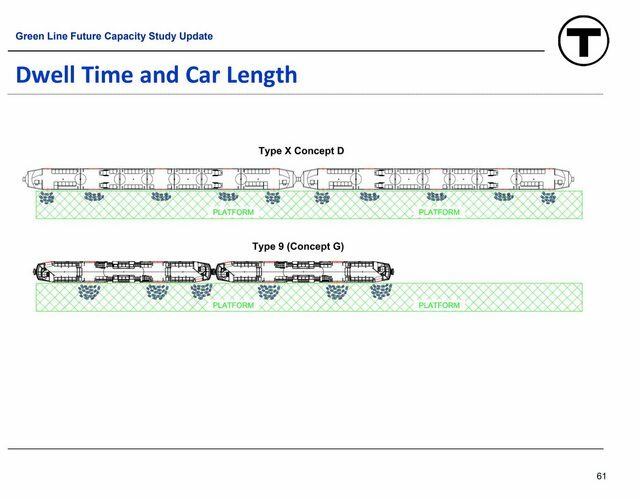 Improvements to B and C to allow 2 type 10 cars will be part Phase IV which is at least 12 years out and mentioned as a "long term possibility"
This means that B and C will be limited to single 10 or dual type 9 trains for at least several years, possibly indefinitely. Though the listed capacity for a single hypothetical type 10 is only 8 less than 2 type 9s (which, iirc puts them on par with the current type 7&8 trains) so not really a loss. There's several slides about how the C-Line track width is currently too narrow, and it suggests center island platforms to allow for increased track width without forcing wheelchair users too close to the road when using the bridgeplate. Does anyone why the track width is an issue? If it was that it's too for type 10s then how is there any possibility of using type 10s before Phase IV? Or is the plan to widen the tracks during phase I and deal with the narrow platforms (since the stations where it'd be an issue aren't wheelchair accessible)? There's a suggestion that they want more room to park trains at Riverside, but the planned redevelopment there will cause issues with this. No mention of what the plan would for type 9s after phase IV, when they would be wholly obsolete, but could have well over a decade left in their lifespan. Interestingly, the documents don't note the Boylston curve as one of the infrastructure restrictions. Is this because it's not as severe as we think (and the screeches come from suboptimal engineering) or because it'll never be solvable and we just have to live with it? Last edited by 34f34f; 05-08-2018 at 09:22 AM. I learned recently that despite the public perception, the Boylston curve is nowhere near as bad or prohibitive as most think or suggest. Street and Tremont Street, where both tracks cross over a former branch to the south. to meet the minimum radius of off-the-shelf vehicles"
Boylston is not bad at all. It's like 90 feet, which is not unusual for light rail systems. Park St loop is not the worst curve either. Lechmere inner loop is. And both the Lechmere inner loop and the Lechmere viaduct are already being replaced by GLX work. I suspect (and hope) the cost and logistics of upgrading 27 B and C line surface stations will force some hard choices on stop consolidation. For Park, the question is can more be sent to turn at Gov't Ctr (outer) loop? I think that is the intention. If you look at page 17 they are leaving the Park St. Loop at 47 ft. but putting a bypass in so that eastbound trains can use the center platform but bypass the loop and continue on towards Government Center. Currently trains in that center platform can't proceed to Government Center, and this would fix that. So the single-platform approach is still the "MBTA preferred approach" to reconstructing all three Newton stations? Why bother spending the money if there's only going to be a single platform serving one track? I think the first thing that mattered was which track the side platform was on (the initial plan picked the wrong one, IIRC), I kind of remember that "single-platform but on the other side" was the conclusion. Maybe that's what they're proposing? This was always a stupid excuse. Note that in the diagram, the X cars have 6 articulation points, versus the current vehicles that have 2. Thats all you need, more articulation joints where the car can "spin"
Thats why you can have a 50-car train make the same turn as a 1 car train. The overall length is not an issue. It helps that many of the stations that are the best candidates to get consolidated or eliminated are on the list. eg 2 of the Warren St/Allston St/ Griggs St set (the latter 2), all of the Saint Paul/Kent/Hawes set, and Brandon Hall. Also its 27 platforms across 15 stations, rather than 27 stations.